Included are the final texts of the Remedies Directives, unofficial consolidated texts, and documents that were formative in the implementation of the Directives (including proposals, common positions, and compromise texts), as well as highlighted excerpts that give an insight into the drafting of the final texts. A list of legislative documents offers as complete an overview as possible of every item that played a role in the creation of the Remedies Directives, including amendments since the Directives came into effect. 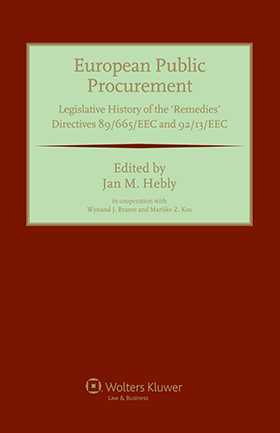 Along with its companion volumes, this important book will be a powerful resource for lawyers and policymakers engaged in the practice and development of European procurement law, and an incomparable desktop reference for scholars and researchers in the field. Chapter 1: Remedies at National Level. List of Legislative Documents in Chronological Order. Directives and Other Legislation Referred to in the Legislative History of Directives 89/665/EEC, 92/13/EEC and 2007/66/EC.